Summer has been mild here in South Texas, and so also has autumn. The fierce afternoon heat has broken, it’s no longer necessary to run the air conditioning. It has been so mild, that the leaves on the trees are just beginning to fall; we haven't had that prolonged cold snap that briskly reminds them that they need to be letting go and moving on, chop-chop. I trimmed one of the grapevines in front a couple of weeks ago - and the poor innocent thing is putting out new leaves already, under the delusion that winter has come and gone. This has been truly the year of butterflies; they are everywhere, about the puddles and in the late afternoon a whole fair of them orbits the almond verbena and the buddleia. 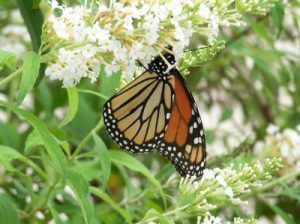 There are the little brown snout-somethings, and monarchs, great lovely tiger-striped things and more than I have ever seen before, resting on the buddleia blossoms as if they can't bear to tear themselves away, while the snout-somethings monopolize the verbena. I have never seen so many and so many kinds: bright little scraps of lemon-yellow, black and yellow, and orange stripes. This morning, the white and brindle cat who lives somewhere up the road seemed to be teased by a butterfly which hovered just beyond reach. He made a couple of fruitless leaps into the air, then gave it up as a hopeless case and sat down to wash himself. Fragile, slow-flying, aimless; none the less, something looks after butterflies. 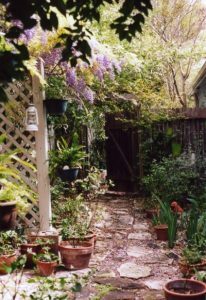 I went to a great deal of trouble a couple of years ago, in digging out an extended flower planting along the back fence, and replacing it with things guaranteed to attract butterflies and humming birds: fire-bush, and esperanza, and dark purple duranta. One almond verbena bush went in the back, to fill up the corner, and now everything is grown up to the height of the fence, and blooming generously. The duranta has purple and white flowers shaped like tiny orchids, but in clusters like a lilac, and the esperanza bears larger, bell-shaped yellow-orange blossoms. From the kitchen window I have also spotted a humming-bird methodically harvesting the esperanza.I used to put out a feeder, without any particular result except having the sugar solution in it go bad. The experts say it is better to plant the flowers they like, rather than let them grow dependent on a feeder. What happens is that one particular hummingbird will take over the feeder as his particular territory, and lurk around driving all the others away. We used to be amused by this; the bully hummingbird squeaking like a rusty hinge, and zipping through the air like an enraged winged lawn-dart. 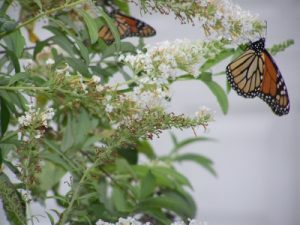 I haven't seen this happening in my yard— everyone shares and shares alike; the bees and the hummingbird, the butterflies on the shrubs, and the tiny wrens, mockingbirds, and the native doves at the feeder. Consider the lilies of the field - they provide for themselves, and give us to much quiet happiness in contemplating them, while we wait for what winter will bring.